In 1988, a filmmaker stumbled on a group of people sticking to their hippie values in Eastern Washington. Fast forward to the new century, and he finds that they are still keeping on keepin’ on. In 1988, a young Seattle filmmaker took a road trip and along the way found what then seemed like a nearly extinct breed: flower children. Director Kevin Tomlinson had wandered into the “Healing Gathering,” an annual campout and get-together in the backcountry of Eastern Washington. Twenty years after Woodstock, here was a group of individuals dedicated to living off the grid, growing their own food, seeking values that had little to do with income. They were blissed out, and Tomlinson was smitten with his discovery, but when he screened the footage with friends back in 1988, it seemed cliché and strangely out of sync. So the idyllic scenes lay in boxes, composting slowly in Tomlinson’s basement. Still, even though he wasn’t sure where to go with the footage, he could not quite let go of the ephemeral images captured on those sunny, pastoral slopes. In 2005, while contemplating a new project with producer Judy Kaplan, Tomlinson revisited the footage with Kaplan. They were both captivated with the notion of trying to find some of the original members of 1988’s Healing Gathering to learn what had happened to these dedicated, hard-core hippies. Their message now seemed prescient — the notions of reducing consumerism, growing food, and investing in grassroots, holistic communities were all top of mind. Did these hippie values stand the test of time or did they just fold right back into the cultural fabric? Tomlinson and Kaplan wanted to see all that remains after two long decades of American change. They took a new road trip, beginning in Tonasket, where Tomlinson first saw the ’88 Healing Gathering flyer. This put them in touch with Jerry Bartels, one of those originally interviewed. Bartels welcomed the idea for a second interview and suggested Tomlinson and Kaplan attend the 2006 Barter Faire, where others would be attending. They ended up with a film, Back to the Garden: Flower power comes full circle, that tells a great deal about people in America who have stayed committed to the values of their youth through changing times. Indeed, the film is a portrayal of just one of what are many groups of likeminded people who have put down roots in various parts of the country. And this group’s hold on their values ended up impressing the moviemakers. Tomlinson brought with him 20 additional years of filmmaking experience when he returned to the Methow Valley in 2006. His perspective as a seasoned producer, director and cinematographer lends a deftness of hand and fluidity that contributes to the sensibility of Back to the Garden. Not mentioned in this film are countless other communities of like-minded individuals throughout America, who thrive under the radar, often live below baseline poverty and consistently contribute to social good with minimal impact on the planet. There are no numbers, only hints — this near-invisibility is by design. Back to the Garden sheds light on lessons to be learned from those building lives off the grid with a closer look at the emotional rewards and costs rather than any focus on fine details of functionality. As for where the producer and director’s sensibilities reside, it is worth noting that producer Kaplan and director Tomlinson now own property in the Eastern Washington region. 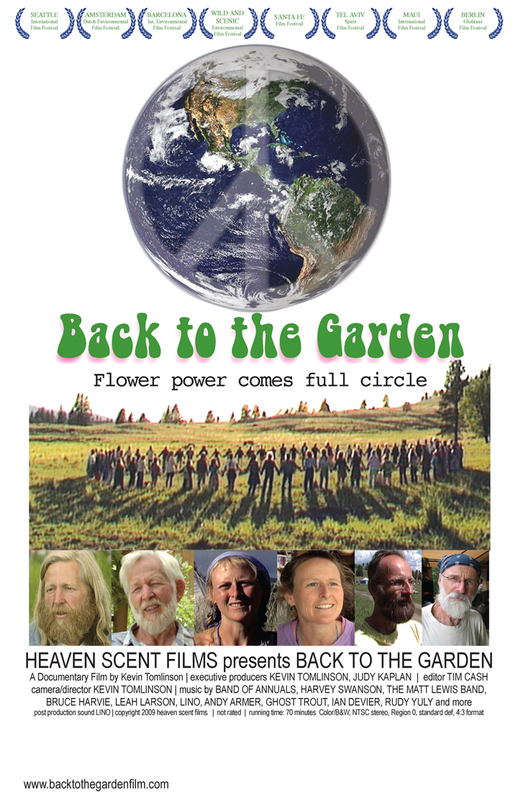 If you want to see it: Back to the Garden, Flower Power Comes Full Circle, Heaven Scent Films, 2009, Documentary, 70 minutes. 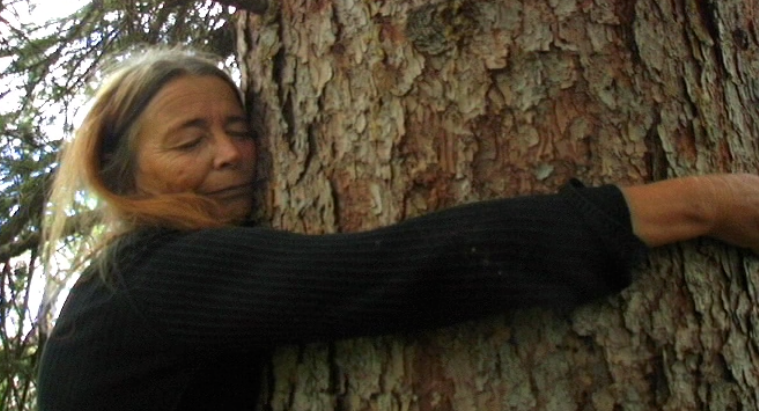 Available at Indieflix, Green Planet Films, or by ordering at www.backtothegardenfilm.com.